Current models and measures of the Interactive Information Retrieval (IIR) process typically assume that a searcher will always examine the first snippet in a given Search Engine Results Page (SERP), and then with some probability or cutoff, he or she will stop examining snippets and/or documents in the ranked list (snippet level stopping). Prior work has however shown that searchers will form an initial impression of the SERP, and will often abandon a page without clicking on or inspecting in detail any snippets or documents. That is, the information scent affects their decision to continue. 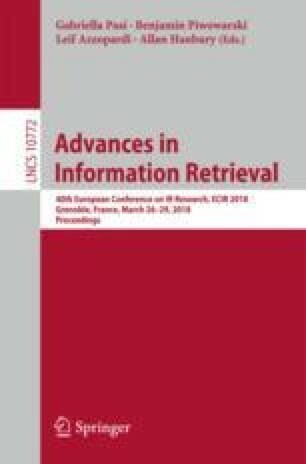 In this work, we examine whether considering the information scent of a page leads to better predictions of stopping behaviour. In a simulated analysis, grounded with data from a prior user study, we show that introducing a SERP level stopping strategy can improve the performance attained by simulated users, resulting in an increase in gain across most snippet level stopping strategies. When compared to actual search and stopping behaviour, incorporating SERP level stopping offers a closer approximation than without. These findings show that models and measures that naïvely assume snippets and documents in a ranked list are actually examined in detail are less accurate, and that modelling SERP level stopping is required to create more realistic models of the search process. Our thanks to Horaţiu Bota and Alastair Maxwell for their feedback – including Horaţiu’s helpful comments on our results. We would also like to thank the anonymous reviewers for their comments and feedback. Finally, the lead author is funded by the UK Government though the EPSRC, grant number 1367507.